I think it’s safe to say that the Aztecs and Mayans used feathers from pretty much every bird in their diverse environments. 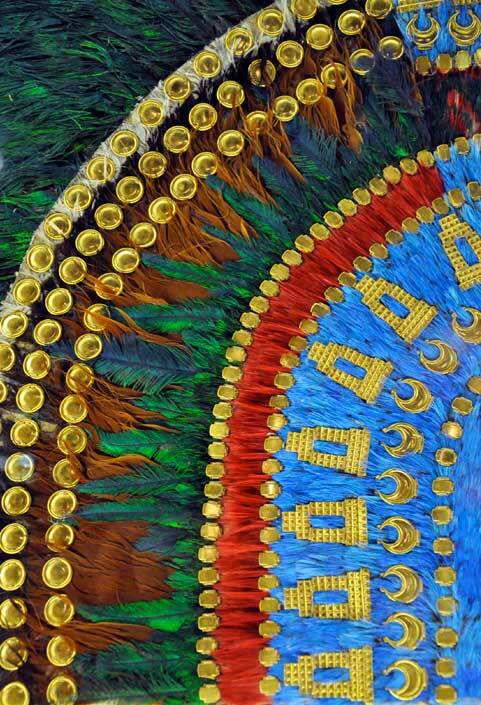 They made spectacular adornments with these feathers, including feathered warriors’ costumes, back devices, fans, banners, and mosaic shields. They embellished textiles (especially cloaks and decorative hangings) with spun feathers. 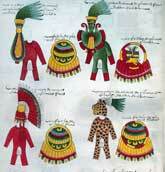 And yes, they made magnificent headdresses and other headgear from feathers. So what about those headdresses? These spectacular adornments were meant to shimmer and flow, and the tail feathers of the male resplendent quetzal achieved this effect perfectly. 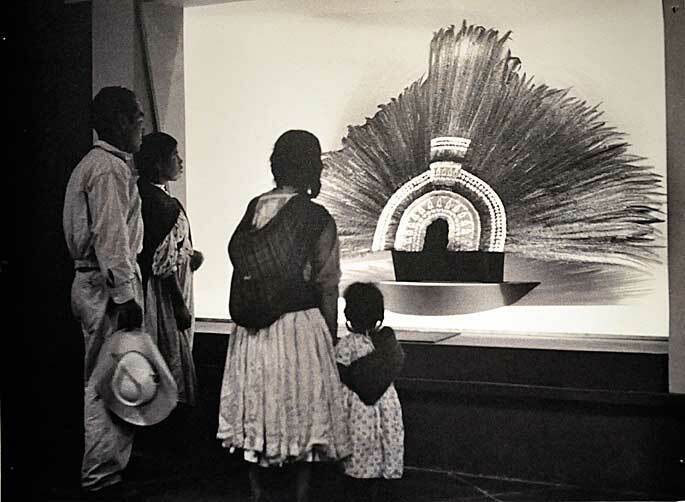 We have an actual example of this: the famous “Moctezuma’s headdress” in Vienna, Austria. The most obvious feature of this splendid object is its flowing mass of green quetzal feathers: there were originally about 500 of them. These feathers radiate out from a complex framework that sat on or above the wearer’s head (although probably not Motecuhzoma’s). A close look at this framework (see pic 3) reveals other kinds of feathers (as well as a great many gold pieces): blue feathers from the lovely cotinga, brown ones from the squirrel cuckoo, and red ones from the roseate spoonbill. We see illustrations of similar headdresses (called quetzalpatzactli by the Aztecs) in codices such as the Matrícula de Tributos, Codex Mendoza, Primeros Memoriales, and the Florentine Codex. These and other documents illustrate headdresses made from different feathers. For the long feathers on the headdresses, the wing and tail feathers of the scarlet macaw provided a red alternative to the quetzal’s green. This type of headdress was named after these flowing red plumes (cueçalpatzactli). Another headdress was named cacalpatzactli after its long black raven feathers. Still, whatever feathers were used as the “main event,” all of these headdresses were also adorned with rows of smaller colorful feathers, especially yellow (oriole or yellow parrot), black (raven), light blue (lovely cotinga), red (roseate spoonbill), and green (perhaps the green parakeet). This answer could go on and on! Still, it is worth noting that these creative people made many types of headgear using an impressive variety of feathers, artistically choosing them for their color, size, and texture. • Pic 4: Image from the Codex Mendoza scanned from our own copy of the James Cooper Clark 1938 facsimile edition, London.